Hi, yes I live in Escondido as well and I believe you live right down the street from me. We have talked before on some mutual NING sites. Where were you trying to click to get into my blog? Lovely giveaway by the way! YAY!!! Brittany, another give away and with skulls. These are the cutest. I would love to be entered. Thanks for finking my blog and for following me! Your things are very cute and creative, I will have to check in often to see what going on over here! How sweet of you to hold another giveaway. You told me about it in the last email, but I've been so busy. Your lil Skully's are great. I love that you have stick pins as well as magnets. Please do sing me up. I am a subscriber of your posts in Google Reader. Does that make me a follower? I actually believe that global warming does exist, because the climate is indeed changing and all over the world things are happening such as Ice Caps melting, other waters rising and our seasons everywhere are taking on a change. Now this isn't to say that much of what we hear isn't hype, we know how that exists, but I still think it is very real. We know pollution is bad for us as well as certain chemicals so it is only natural that they play a role in something not so good as they get released into the air and ground. If smoking is bad for us if we "inhale" lol then surely it going into the air is causing a problem same as toxins released from auto exhaust. Now, one day you should share your opinion and why. You are entitled to it and anyone who doesn't allow you your opinion isn't worth bothering with. Cheers. Love these skullies! Thanks for following me, now I am following you!!!! Beautiful work...and thanks for visiting me! Global warming. YES! I don't believe it is hype at all! We won't listen though...we never do. I mean..after all..none of us alive today will live to see the disaster...or...so we think! Yes! I said hugs! Your deserve it for all that lovely work you do!!! Thanks for stopping by my blog! I just l.o.v.e. SITS, don't you! Put me in for the drawing. I just love handmade things! plus also I am a new follower! And lastly, (for entry #3) my feelings related to the global warming issue are that yes, we need to take care of our planet. I feel like it is a gift to us from God and we should respect it and care for it. But do I feel that as mortals we are single-handedly able to cause and/or prevent its demise, no. Your work is sooo wonderul!!! The colorings and the textures you use are great!!! LOVE IT!!! I pray you're staying safe with the wildfires in your state!! Take care my new friend!!! Thanks for stopping by my blog...now if I can only figure out the rest like how to follow I will. I just need some time here to figure it out...lol! Great blog you have! Thank you for following me, and your nice comments... your sculls look great! Hi, Brittany! I'm here because you found my blog, and now I've found yours. Your skulls are so fun and colorful. I'll be back! Oh, and by the way, I do believe in global warming, but I also believe that the climate goes through cycles. Throughout history, there have been times of global cooling and global warming. However, that doesn't mean that we shouldn't do all we can to stop pollution and take care of our world. Thanks for the comment on Star Trek and the Mother's Day wishes over to my blog. Wishes back to you. If you were on the fence about seeing the movie, I say go and enjoy. If you are a long time fan, it's a kick and a half getting the inside jokes and if you are not, it's great mindless fun. I have become a follower of your blog as well. I do believe that global warning is NOT a myth. My Da, the scientist and I spent a car ride from CO to MI talking about it and what we feel the changes have been. Thanks so much for your very kind words. Lovely to meet you in blog land. You have some wonderful work. hello Brittany, thank you for visiting my blog....I am reading up on yours now - cool stuff! You & I share a love of color. Also, you inspired me to put a "followers" section on my blog to make it easier for those who may wanna follow along. Thanks and cheers! I'm a follower! You are talented and your creations are exciting and fun! hhhhhhhh... I am having a brain drain day. I am now a follower of your blog (my eyes hurt in a good way), I have posted your giveaway and site on mine. If this hurts my chances that's okay - I don't believe that you can agree or not re global warming. Global warming is a fact. These are very cool! I love Day of the Dead art!! I just discovered you today as I am a new member of Millande's ning and one of the subgroups. SO I just started following you! Horray! I just beboped in from SITS and I love the skullys! I am now following you, pretty please enter me. Thanks for hosting this giveaway. Hi! Thanks for following my blog! I have nover been called a doll before but i think i like it! How do I follow you?? I don't see any "followers" button. I like your blog. Nice job. Thank you so much for popping by for a visit on my Blog. I am not sure why you couldn't follow me but you are the third person today that said they had trouble so I just sent an email to Blogger to see if they are having any issues. Please do try again at a later time because I would love to have you follow me as well. I adore these little skulls! What a nice giveaway!I love all the colors your use in your creations :) I am going to go sign up to follow you now. I love your work! 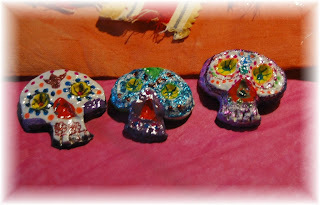 And I have to enter your give-away because I love skulls - and anything to do with Day of the Dead celebrations! I've linked to your giveaway on my sidebar on my blog. Oh. Global Warming. I believe that there is a natural process of warming that our atmosphere is going through. I also believe that our carbon footprints are moving it at a faster rate than it would have without it. I don't believe the rabid fanatics on either side of the fence...as often happens, I believe the truth lies somewhere in the middle. Oh - and your steampunk cherub baby boom sculpture! It's super! Nice to meet you. See you 'round the traveling art doll group!